Description: An annual plant, grown in semi-arid regions, and very commonly grown and eaten in India. In fact, India is the largest grower of fenugreek in the world. It is used a fair amount in Indian and some Middle Eastern cuisines. It has a distinctive acrid flavor and aroma and so, is used is very small quantities in any recipe. In Indian cuisine, the leaves of the plant are also used, often as a spinach dish - it has a slightly bitter note but is considered a favorite ingredient. The seeds are also used in Indian cuisine, largely as part of a spice mix - their acrid flavor is used to round out other spice flavors. Kitchen Pharmacy: Fenugreek has traditionally been prized in Ayurveda for it's therapeutic properties - it is believed to help reduce blood sugar in pre-diabetics and diabetics. 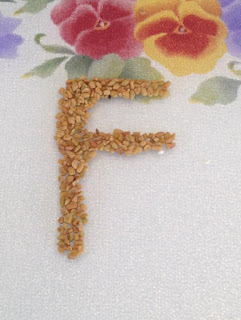 Ayurveda prescribes fenugreek powder in small doses daily as a way to treat high blood sugar. Interestingly, medical research in the West today is also proving some of this traditional knowledge to be true. Several human intervention trials demonstrated that the antidiabetic effects of fenugreek seeds ameliorate most metabolic symptoms associated with type-1 and type-2 diabetes in both humans and relevant animal models by reducing serum glucose and improving glucose tolerance.